Add a copper heatsink cooler for a Socket 7/370 CPU for a 1U server. This 60x10mm Socket 7/370 CPU Cooler helps keep your 1U servers running smoothly, by providing a reliable, cost-effective server cooling solution. 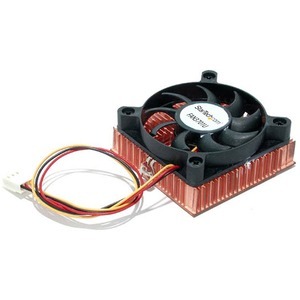 The server CPU cooler features a copper base and socket-type CPU fan, ensuring rapid heat dissipation in the reduced space of a 1U server environment. The CPU cooler is powered through a simple TX3 connection to the server power supply, and is suitable for all Intel Celeron/PIII processors and AMD Athlon/Duron processors up to 1GHz.